It's not you. It's the food. There are many good articles on enzymes on the Internet from people like Dr. Howard Loomis, my mentor, Dr. Mercola and the European Food Information Council(EFIC). Unfortunately, many great articles are not in English. Mine is. There are some vicious loops I’d like to talk about. Some are in the food itself, and others are in many of us. 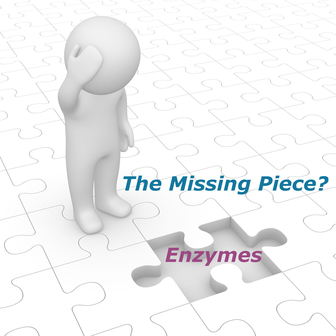 Enzymes are natural molecules that, among other things, help us digest. They are essential to good health. If we lack the enzymes in our food and we cannot produce what we need for our bodies, our bodies will find unending ways to act out, usually by developing symptoms. The EFIC talks about food without enzymes. Dr. Mercola talks about raw food. One of the challenges in today’s world is that even the raw food you buy may not have enzymes. Food is picked too early and shipped too far. Many of the genetically modified foods do not produce enzymes, thereby increasing shelf life but not supporting life. Buying organic avoids the latter challenge, but not necessarily the former. Many recommendations about raw food diets are so old that they do not take these factors into account. Will they help you? Sure, if you are starting from a fast food or pre-prepared diet. Enzymes are made up from proteins. That can be a real challenge if we are in a situation where we do not digest protein well. It can also be a challenge if we are using things like acid blockers, as they further reduce the capacity to digest our foods by altering the pH in our stomach. Enzymes work at different pH levels. If you change that in the body, some will no longer be active. There may be other factors as well, like the blocking actions that are the basis of many pharmaceutical products. There are other catch 22’s, but let me correct one misunderstanding I have heard more than once. “My doctor measures my liver enzymes to find out if I am healthy, so aren’t some enzymes bad?” To quote from LiverEnzymes.net, “Liver enzymes are proteins that help to speed up a chemical reaction in the liver.” If your liver is challenged, more enzymes will be made to help meet the challenge. These can be measured to grade the challenge. It is much the same thing as needing more water if you are in a sporting event and it is hot out than if you are sitting around in air-conditioning. The level does not make the thing bad – it is the bad thing that makes the level. So, what is the answer? Well, we could buy heirloom seeds, grow our own food year-round and pick it ripe. I don’t know about you, but it is unlikely that my lifestyle and location will allow that. In my practice, I find that many clients do better in the summer when they are buying from local farm markets. The other answer is supplementation with a good, general, digestive enzyme. The best thing is to find someone like me local to you to help you restore as much normal function as you can have based on a number of factors. As alternative health specialists, we do not cure or treat. We simply support your body to restore normal function. Health is the ability to enjoy life. I help get people healthy and stay that way naturally. Contact me if that appeals to you.